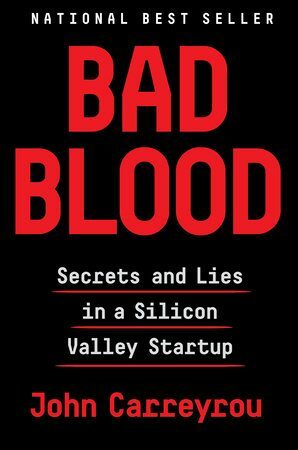 I recently finished reading “Bad Blood – Secrets and Lies in a Silicon Valley Startup”, by John Carreyrou. It’s a remarkable piece of investigative journalism and an amazingly grabbing read. I just couldn’t let it off my hands. I think it particularly stood out, because the amazingly stark contrast with another book I just recently wrote about: “It doesn’t have to be crazy at work”, by the co-founders of Basecamp. “Bad Blood” tells the story of Theranos, the biotech startup that promised to revolutionise blood testing, and its founder, Elizabeth Holmes, who became a super-star celebrity and Forbes’ “youngest and wealthiest self-made female billionaire in America”. The author interviewed hundreds of people, many of whom worked for Theranos, and paints a remarkable picture of the ascent (and ultimate demise) of the company. I don’t think I’m capable of a review that does the book justice, so I would urge you to read it and see for yourselves. I’ll try to avoid major spoilers, but it might be unavoidable to completely leave some details out. Please forgive my narrow focus, but I would like to focus on things that revolve around startup culture, investment vs bootstrap mentality, and the startup innovation mindset, rather than admittedly much more important issues like patient safety. If one thing was clear from the book, Elizabeth Holmes must have been nothing short of a wizzard at sales. It’s totally beyond me how a young college dropout managed to get such a massive investment and support, not to mention meetings with top executive at the world’s top pharma companies. I only wish to meet someone with a tiny drop of her sales skills. Of course, as most people who aren’t doing sales must agree — and hopefully some who do — you need a product that delivers. Or at least one that isn’t so blatantly incapable of delivering as was the case with Theranos. Much more often however, companies do create decent or even some great products, but struggle to sell. It’s a tricky thing. Innovation. There are so few products that truly innovate, let alone revolutionise. Most progress is painfully slow and incremental. But there are great businesses that prosper and succeed without any major innovation. They’re “just” making things a bit easier. A bit faster. A bit more intuitive. I’m not talking about lacking imagination completely. Don’t be boring. There are very few examples of “true” innovation (whatever that means). And I’m not sure, but perhaps they do take some kind of “genius” to get there. And perhaps an outsider, rather than a veteran expert, can come up with dreams that the expert won’t be able to come up with. Especially being too familiar with all the many constraints, and essentially suffering from a form of tunnel-vision. But with a huge amount of money, focus and direction, I’m pretty sure some things previously thought of as impossible can become a reality. Getting people to walk on the moon. As far as I understand, actually having a person there wasn’t that important. But the ambition to do this, despite all the challenges that must have been present at the onset, actually led to some great advances in technology I’m sure (sorry, I’m actually just speculating here, I don’t really know anything about space travel). But it’s a huge gamble ultimately. I have to say, I kinda admire Holmes’ insistence on certain things. Like using a small amount of blood, and keeping things small. Maybe there’s a breakthrough to be made, and maybe by not giving-in to experts, it would become apparent. But there’s a point where reality hits and you have to cut your losses and accept it. Compromise. Settle for a big improvement that won’t win you an award, but can change people’s lives. Sadly, With a huuuuuge Silicon Valley investment money, extravagant PR campaigns, and sales deals that revolve around massive promises, it’s so hard to backtrack. To admit defeat. The pressure is too strong. And that’s part of the investment mentality and culture that ultimately hurts innovation in my opinion. Iterations and failure are important aspects of innovation. Failure should be embraced as a learning opportunity (and to ensure similar mistakes don’t repeat). If there’s one thing that was such a polar opposite of Basecamp, it’s the “Butts in seat” mentality that the book depicts so ingrained at Theranos. People are valued when they work longer hours. Longer hours = harder = better. The idea of working longer hours equates to working harder is a very obvious fallacy. After all, someone can just be lazy and spend time at the office, chatting on Facebook. But this was embraced at Theranos. And it was particularly toxic, because if someone works on a Saturday, the implication is that their colleagues are slacking off if they don’t. What a horrible death spiral. I think the less obvious one is that working harder is better. Up to a point, it is. But lots of people can work really hard and achieve nothing. Some work can cause actual damage, not to mention lack of actual improvement. And ultimately, work breeds more work. If you hire a product manager, they’ll want to improve the product. They’ll come up with great ideas. They’ll need feedback. The product improvements need lots of work to implement. So you saved yourself some time managing the product, but now have to allocate time to manage this person, and other people who need to work together with this new person are also becoming busier. Naturally, there are lots of projects or ideas that are worthwhile and can move your company forward. But it’s amazing how many times you just don’t know if something is worth doing. In that sense, I find Basecamp’s attitude the most sane. You just set no expectations in terms of time. You measure actual work for what it’s worth. And you default to “No”. You also hire when it really hurts. Not before. I wonder if there’s a way to encourage less work though, as a way to increase productivity and focus. It’s hard. That’s where I think you shouldn’t be afraid to get rid of stuff. Yes, someone worked really hard on it. And it was worth trying. But if it doesn’t produce enough value, then aren’t we just clinging to it for the wrong reasons? It’s extra weight. It’s a liability. Not an asset. I find it incredible how a culture of lies is built. It usually starts small. Let’s just say that we have this functionality, because we can add it later if we really need to. Let’s just fudge this number. And before you know it, you’re in a web of lies that make it impossible to backtrack, and you need more lies to keep the story. This also relates to “saying No” that Basecamp advocates. It’s so easy to say Yes and commit to doing something later. It’s much harder to say No and feel like you might miss on a great opportunity. It’s so easy to look at the things you’ll get from something, but ignore the actual cost. And it’s usually not the direct cost, but all the residual, hidden ones. Opportunity cost, focus, support, maintenance, feature bloat. Maybe you promise a feature to one of your customers. It makes sense to have this, and maybe other customers would need this feature too. So let’s do it. We’re not just investing in this one customer, but in others. It will make our product better. Later on you might find yourself with this one feature used by this one customer, or maybe a couple more. And you can’t take it away. This one feature is actually making your life much harder, because other features collide with it. Or this one feature is actually in the way of other customers from keeping things simple. Now don’t get me wrong. I’m not a saint and I don’t advocate telling things that you don’t need to, for the sake of honesty. I can totally get why marketing copy needs to put a positive spin on things. Make it shine. Make it appealing. Focus on the good things, and don’t mention the bad ones. But don’t lie. And think long and hard about making promises. One other thing that amazed me with the Theranos story, was how quickly things collapsed. They built an insane house of cards, a web of lies that they’ve woven so carefully, a secret sauce they so fiercely guarded. And ultimately a couple of people was all it took for the whole thing to collapse. One of those was a young graduate, with no industry experience, who only worked for the company for a few months, in a fairly marginal role. This person was key. That’s the problem with lies and deception. It takes very little for it to crumble and for the truth to reveal itself. It’s also why I think open businesses, open source software, and transparency is a strength. You’re opening your cards, so nobody can use your secrets against you. Surprisingly enough, in many cases it’s not your innovative algorithm, but your reputation and ability to execute and satisfy your customers that wins. Yes, they can copy your software and build a team to run it cheaper perhaps. But why would they when your service does it well for them, and they can focus on their core strengths. Powerful men don’t wear a Toupée. Because it makes them weaker. People know they have something to hide, and can use it against them. Yoav thanks for the recommendation. I finished it yesterday. It is so interesting to learn some details about how those venture backed start ups work (sure not all of them). I also liked your points especially the one about saying no. Fot me though the most important observation is Holmes ‘ personality. What kind of experiences has a 19 years old girl? What does she know about business and decisions? I think the only experience that she has is the one that her family gave her. The impact of the family in her personality was disastrous. What you describe as a great saleswoman for me it’s just lies in order to earn money. The family and her closed ones are for me responsible for most of the unethical decisions as ceo of theranos. Anyway the book was a great read. Waiting for the next one ? Thank you, Dimitrios. There are lots of sales people who tell lies, but very few of them manage to get hundreds of millions in investments and go on the cover page of Forbes. So I think she had a bit more talent than just lies :) It’s depressing that those skills were used to manipulate people, but they are still noteworthy, don’t you think?